(Top) The protein albumin in the egg white undergoes denaturation and loss of solubility when the egg is cooked. (Bottom) Paperclips provide a visual analogy to help with the conceptualization of the denaturation process. Denaturation is a process in which alcohol or chloroform), radiation or heat. If proteins in a living cell are denatured, this results in disruption of cell activity and possibly cell death. Denatured proteins can exhibit a wide range of characteristics, from conformational change and loss of solubility to aggregation due to the exposure of hydrophobic groups. Protein folding is key to whether a globular protein or a membrane protein can do its job correctly. It must be folded into the right shape to function. But hydrogen bonds, which play a big part in folding, are rather weak, and it doesn't take much heat, acidity, or other stress to break some and form others, denaturing the protein. This is one reason why tight homeostasis is physiologically necessary in many life forms. Denatured proteins can exhibit a wide range of characteristics, from loss of solubility to protein aggregation." Proteins are amino acid polymers. A protein is created by ribosomes that "read" RNA that is encoded by codons in the gene and assemble the requisite amino acid combination from the genetic instruction, in a process known as translation. The newly created protein strand then undergoes posttranslational modification, in which additional atoms or molecules are added, for example copper, zinc, or iron. Once this post-translational modification process has been completed, the protein begins to fold (sometimes spontaneously and sometimes with enzymatic assistance), curling up on itself so that hydrophobic elements of the protein are buried deep inside the structure and hydrophilic elements end up on the outside. The final shape of a protein determines how it interacts with its environment. When a protein is denatured, secondary and tertiary structures are altered but the peptide bonds of the primary structure between the amino acids are left intact. Since all structural levels of the protein determine its function, the protein can no longer perform its function once it has been denatured. This is in contrast to intrinsically unstructured proteins, which are unfolded in their native state, but still functionally active. Most biological substrates lose their biological function when denatured. For example, enzymes lose their activity, because the substrates can no longer bind to the active site, and because amino acid residues involved in stabilizing substrates' transition states are no longer positioned to be able to do so. The denaturing process and the associated loss of activity can be measured using techniques such as dual polarization interferometry, CD, and QCMD. In very few cases, denaturation is reversible (the proteins can regain their native state when the denaturing influence is removed). This process can be called renaturation. This understanding has led to the notion that all the information needed for proteins to assume their native state was encoded in the primary structure of the protein, and hence in the DNA that codes for the protein, the so-called "Anfinsen's thermodynamic hypothesis". 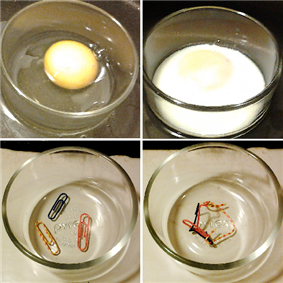 One example of renaturation is that an egg white can be uncooked using vitamin C or sodium borohydride. The denaturation of nucleic acids such as DNA due to high temperatures is the separation of a double strand into two single strands, which occurs when the hydrogen bonds between the strands are broken. This process is used during polymerase chain reaction. Nucleic acid strands realign when "normal" conditions are restored during annealing. If the conditions are restored too quickly, the nucleic acid strands may realign imperfectly.